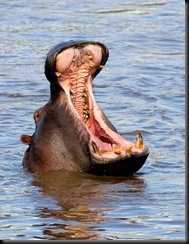 What big teeth you have..
She’s been able to say the word hippopotamus since very early. Who know why.. is it easy for kids to say? Does she like the hard syllables? I have no idea. She pretends she is one during her bath at night (sometimes she’s a seahorse or a mermaid). But that comment yesterday caught me totally off-guard. Couldn’t believe she made the comparison. As an aside, you should be able to see the images now on LJ. It was brought to my attention by delbruc that my image links were always broken when it was cross-posted. This wasn’t a problem with the images, so much as the fact that I blocked all hotlinking from sites other than my own, as I was having bandwidth stolen. So I added LJ to my list of exceptions in my .htaccess file and now the images display as they should. 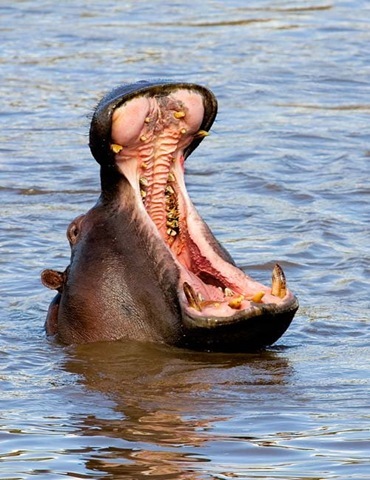 This entry was posted in Family, Personal and tagged alia, hippopotamus, images by Weezel. Bookmark the permalink. Next → Next post: SsSss SsSSs Ss! !